The Battery Backup UPS That Saved My Business From LADWP – Battery Backup Power, Inc. 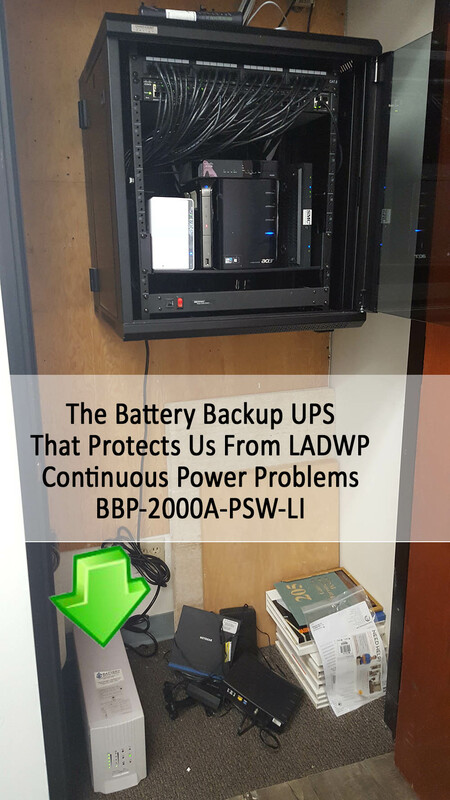 In late 2014, a Los Angeles, California based insurance agency purchased and installed a 2000 VA / 1200 Watt Battery Backup Heavy Duty UPS (Uninterruptible Power Supply) And Voltage Regulator, model number BBP-2000A-PSW-LI as per the recommendation of their IT company. The Battery Backup Power, Inc. UPS replaced an older major consumer brand UPS that was plugged into the wall outlet in the server room with all critical networking and server equipment plugged into a power strip which was plugged into the back of the UPS. Even though the major consumer brand UPS was installed prior, the attached networking equipment and servers still tended to immediately fail every time the voltage dropped or power dropped completely. The issue with the major consumer brand UPS was later discovered to be a lack of pure sine wave output when switching to battery power and a 12 millisecond delay before backup power engaged. The Battery Backup Power, Inc. UPS has consistent pure sine wave output whether on steady utility power or in backup battery mode with only a 4 millisecond delay (3 times faster switch over). The major consumer brand UPS was purchased because it only cost 1/2 of the Battery Backup Power, Inc. UPS. If not attached to newer, sensitive, energy efficient IT equipment, the cheaper, major consumer brand UPS would have probably worked fine. The reason for the change and new willingness to spend twice the money on a UPS was due to the fact that the insurance agency would completely shut down at least three times a week due to power related issues. The modem, router, managed switch, NAS (network attached storage), and servers would all completely shut down during even the tiniest voltage fluctuation. On 2 occasions in the years before installing the Battery Backup Power, Inc. UPS, the power supply on one of the servers needed to be replaced after a power failure bringing the agency to an operational standstill for days. Since all of the phones were VOIP from Ring Central (they are now on Vonage Business) the employees could not make or receive phone calls until the entire server stack came back online after a power issue. 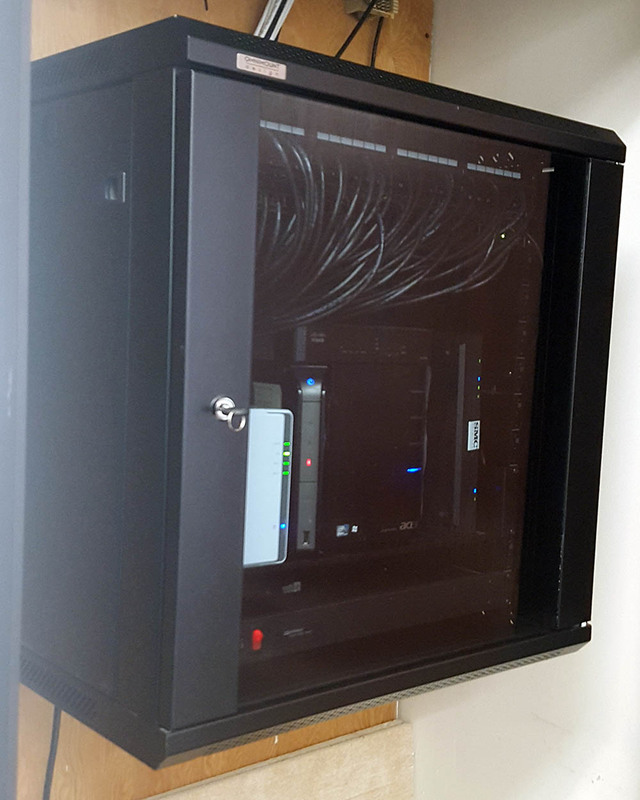 Since the Battery Backup Power, Inc. UPS was installed in the server room and eventually at every workstation back in 2014, the partners of the agency stated that they haven’t had one instance where their agency has shut down due to a power issue during normal operating hours. There has been an instance over the weekend where a power outage lasted longer than 45 minutes and the UPS ran out of battery power, but luckily the prolonged power outage did not happen during the week. The senior partner stated “that little white box [Battery Backup Power, Inc. UPS] has saved my business from LADWP”. LADWP is short for Los Angeles Department of Water and Power. According to Consumer Affairs, the power company has a 1.2 star rating at the time of this writing due to a variety of consumer complaints (https://www.consumeraffairs.com/utilities/ladwp.html).